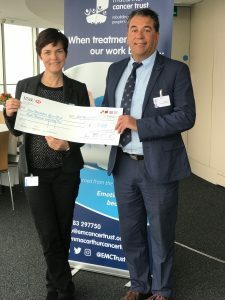 Even more young people will be given the opportunity to positively embrace their future after cancer treatment thanks to the highly successful BT Tower fundraiser day last Thursday (28 March). 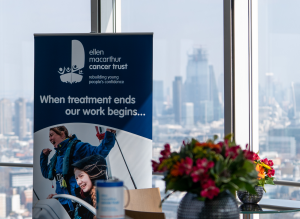 Over £49,000 was raised after BT once again welcomed the Ellen MacArthur Cancer Trust to host a fundraising day at the Iconic BT Tower. No longer open to the public since it closed in 1981, the Trust is privileged to be given the opportunity of returning to the tower for the sixth time to raise vital funds. 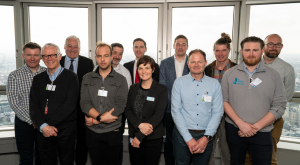 The day was kicked off bright and early by Dame Ellen MacArthur on the 34th floor of the revolving restaurant, giving the Trust’s corporate partners the chance to see the difference their support makes. 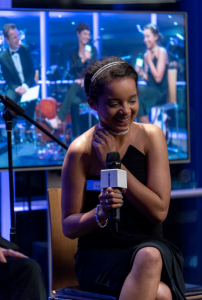 volunteer Krissie Cartwright-Riley as she shared her story highlighting the profound impact the trips had on her life in a Q&A with Ellen and compere Alec Wilkinson. Guests then enjoyed a full English Breakfast and 360-degree views over London as the Tower famously rotated. It was a great start to the day with over a thousand raised through the raffle thanks to Lymington Yacht Charter for donating the prize, followed by a cheque presentation by Nick Covell, Chairman of the Little Britain Challenge Cup who raised over £8000, all before 9 am. Following on from the corporate breakfast, it was time to greet the cyclists that will be taking part in the Trust’s Largs to Cowes Charity Cycle. It was a great chance for the core riders to get together to share training tips and advice over a coffee ahead of their epic challenge this May. After wishing the dedicated riders the best of luck it was time for Ellen to host a private donor lunch, accompanied by Krissie they shared the Trust’s vision of supporting every young person who has experienced cancer. The day was topped off with a stunning sunset followed by a black-tie gala dinner. The star of the show was once again Krissie who bought home the very real difference the Trust makes. Inspired by her story the guests didn’t hold back with their generous bids in the auction. 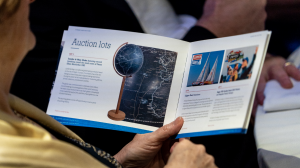 The first lot, a beautiful Lander and May globe, commissioned to celebrate Ellen’s circumnavigation of the world, created a bidding war followed by five other prizes all generously donated. The prizes included a Clipper Race Experience, Super VIP Carfest Tickets, Houses of Parliament Tour thanks to Mark and Sally Tami MP, a Scottish Open Experience thanks to Aberdeen Standard and a Full 3 Layer Musto Offshore System Kit. After a jam-packed 17 hour day in the BT Tower, an incredible amount was raised which will give more young people a positive future after cancer. 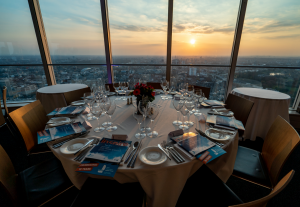 BT kindly covered all the costs of the entire day, particularly Dee Turner and all the dedicated event, catering, security and lift staff at BT Tower. Also a huge thanks to all the companies that donated auction prizes, Krissie Cartwright-Riley for sharing her experiences of the Trust, Alec Wilkinson the days compere and auctioneer, and everybody that attended the special event, it really was a day to remember! You can view photos from this amazing day on the Trust’s Facebook page here.